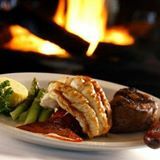 World Class Steakhouse Serving USDA Prime Steak Exclusively! Located on the 21st floor of the Bank of America building in the Bellevue Place complex, guests enjoy stunning views of the Olympic Mountains, downtown Bellevue and the Seattle skyline. Our two decks provide outdoor dining to guests year round. The Prime 21 Spirits Lounge, a high-end spirits bar, features a large selection of bourbon, scotch and rum. Daniel’s Bellevue is open for lunch, Monday – Friday and dinner nightly. Add happy hour twice nightly, live piano music nightly, our Wine Spectator, Best of Award of Excellence award winning wine list and our exceptional service and you can see why Daniel’s Broiler defines steakhouse excellence in Seattle.